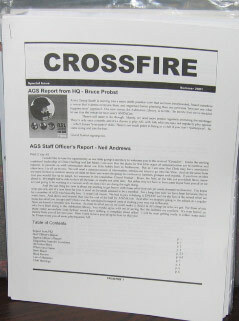 The earliest known issue of Crossfire is from June 1996; it was apparently designed as a monthly newsletter, but never achieved that. Early issues, edited by Dave Bardi and Steve Banham, primarily include local ASL news, tournament reports, and scenario AARs. The content was typically not very substantial, although some of the AARs were good. The first iteration of the newsletter does not appear to have lasted very long. However, in 2001, Army Group South tried to start Crossfire up again. The new version was intended to be published 5 times a year, but that too proved wildly optimistic. A relatively small ASL group to begin with, Army Group South’s newsletter frequently contained laments about people not showing up or people having dropped out. Still, any ASL club is better than none, as every ASLer knows. The final issue appears to have been Volume 1, No. 3, and that issue actually contained a scenario, Alaric’s Return, featuring Germans vs. Italians the day after the Italian armistice was announced. This issue of the newsletter is currently downloadable at http://users.bigpond.net.au/asl-victoria/crossfire%201-3.doc. The scenario appears on the last page; however, the formatting appears to be messed up. Only part of the scenario appears on the page. To make the whole scenario appear, position the cursor immediately above the visible part and do a “hard return” (control-return). This will force the scenario down to the next whole sheet of paper and it will be visible and printable. A hidden scenario! Mark that document fails to either load or download, if you have a hard copy can you make it available please? PSS. I tried it with Chrome, Firefox and IE, no success. You are going to have to track it down on your own. This is why I don’t like having any links to outside places at all, because they change without warning.